You can request a price estimate and a free viewing by contacting 020 3746 3201 or sending an online request. Initially started as an expert cleaning company, Better Cleaning Company has a major potential to become a leader in rubbish collection Romford industry. We have modified the most typical standards in the field in communication to the latest strategies and trends in safe and eco-friendly junk collection. 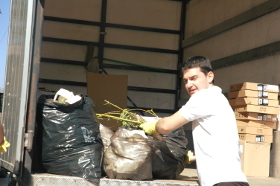 As a result of our hard work, various researches and expertise of more than 10 years, our rubbish removal services is now one of the best alternatives you've got in London. To complete the mission of junk collection - regardless its type - we have great squads of qualified junk removal specialists, who are well-trained and tested. They are fully insured and vetted, ready to deal with any volume and kind of garbage. Please, keep in mind that we deal with any type of rubbish, not including only medical and hazardous items, meals and paint. Dealing with building waste is a true headache if you are not equipped with the appropriate tools, transport and if you have to do it all by yourself. No worries - we are always ready to provide you professional building waste removal Romford RM according to the laws and regulations. Our service is in particular useful for renovation debris removal and bulky waste clearance. Our staff will do all the weighty loading & lifting of the builders waste. We will help you save time, efforts and financial resources for leasing a van and so forth. If you want help with the clearance, disposal & loading of junk and various other unnecessary items, book our effective rubbish removal service right now! If your garden needs cleaning up from twigs, grass, leaves and tree clippings or other garden repair waste, we can offer you affordable and reliable garden waste collection Romford RM. Our rubbish collectors are skilled and equipped to load, collect and dispose of your waste quickly and at a reasonable price. We offer expert green waste removal, brown waste removal and squander recycling to all local personal and business residents. If you want to get our excellent quality rubbish removal services Romford RM, you need to contact our twenty four seven phone line 020 3746 3201 or submit an online request form for a free viewing or even directly ordering our service. Better Cleaning Company ensures a quick arrival of our experienced two men teams at your home. They will examine the volume of the waste materials, and will offer you a price estimate right then. Loading & collection will commence right after that. As a licensed rubbish waste carrier we always do the recycling on your behalf.